Professor Jenna Drenten explaining the differences between these four emojis during the inaugural Q Talks: Live! event. Emoji, animations, and other visual social media are creating a new language, said Professor Jenna Drenten at the inaugural Q Talks: Live! event in November. 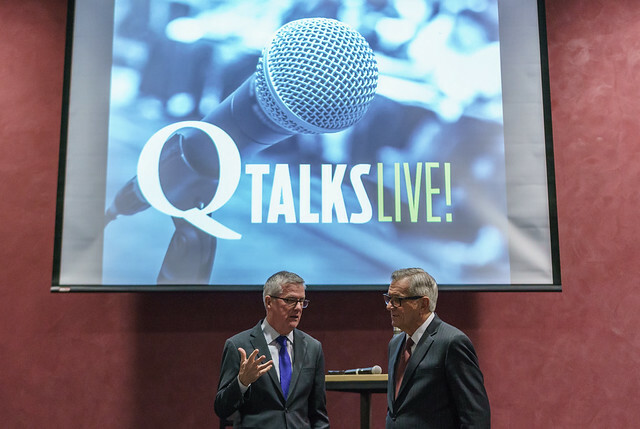 Drenten was one of three featured speakers at the Q Talks event, which also featured Professor Tim Classen unpacking the opioid crisis and Professor Al Gini on the importance of humor. Q Talks is part of the Dean’s Alumni Series. Drenten offered three ways that visual social media is changing the way we communicate. 1. Visual social media is a form of language. We use visual social media as a form of language, “and with any form of language, there is a learning curve, but unfortunately with social media, the meanings aren’t always clear,” said Drenten. As an example, she recounted how her father used a laughing emoji with tears instead of the crying emoji he meant to use after the Loyola men’s basketball team’s Final Four loss. People also have to navigate emojis that have taken on sexualized meanings, such as the peach emoji. Drenten added that this language of visual social media “helps us express our emotions beyond words,” adding humor and other complex emotions to our communication. 2. Visual social media provides a form of evidence. “We are living in an era of pics or it didn’t happen,” said Drenten. “We provide this evidence in ways that express who we are and communicate something about our experiences,” from proving that you voted to showing the real experiences of people fighting cancer. Unfortunately, “we can’t always trust what we see online,” said Drenten. “The ‘evidence’ is easily manipulated,” including through photo manipulation or simple camera angles. 3. Visual social media is a form of self-expression. “Visual social media says something about who we are and what we find important,” said Drenten. On her own Instagram account, Drenten posts about friends, family, students, and her travel adventures. Visual social media such as Pinterest can even help navigate new experiences and changing identities. In one of Drenten’s research studies, one participant turned to Pinterest to help her transition her identity from girlfriend to fiancée and then to wife.